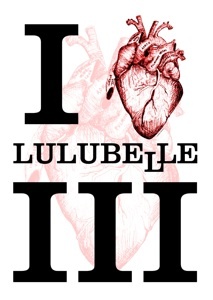 Lulubelle III’s debut CD A Saucepan Full of Sequins is available to buy. It comes in a jewel case with a four colour insert. Price depends on where it is shipped to, choose UK, Europe or US/Rest of World from the drop down menu below. Lulubelle III’s second album Foyle Delta Blues is available to order. It comes in a jewel case with a four colour insert. 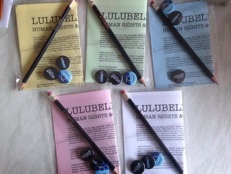 Lulubelle III’s third album Human Rights & Wrongs was released on 16th March 2015. Retail CDs can be ordered here and will be delivered within 28 days, it is usually shorter than that but sometimes our winged monkeys get tired. They are in a jewel case with a four colour insert. For a limited time while stocks last FREE goodie bags are available with Lulubelle III badges, pencil and booklet. Hurry these won’t last long! 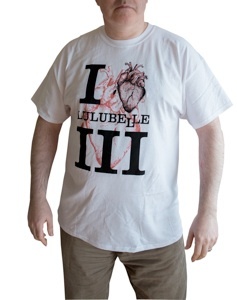 Prepare yourself with a cool Lulubelle III t-shirt. T-shirts are amazingly good value at £10 each. Prices shown below depend on where it is shipped to, choose UK, Europe or US/Rest of World from the drop down menu below. Shipments are made once a week and may take up to 28 days for delivery.